Sorry for being out of communication for the past week or so. 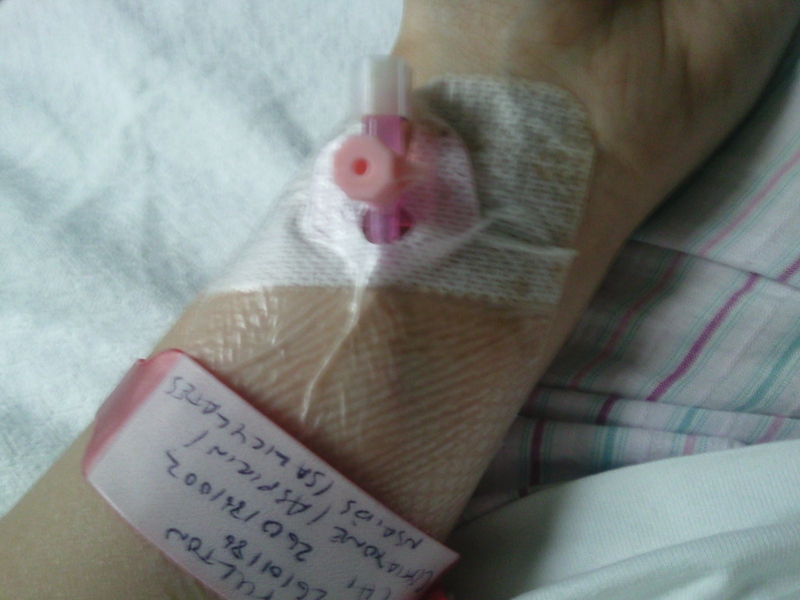 I had to go into hospital as I had an asthma attack. I am not quite sure what caused it but the Dr’s are of the view it has been a combined thing between poor asthma control, very high pollen counts and just generally pushing myself a little bit too much recently. I have to say this admission was not pleasant (well no admission is but this one was particularly not good). It was not so much the severity of the attack which for me was not too bad but it was the other complications that seem to become more of a problem each time I go into hospital. The attack itself took its usual course and I needed my usual treatment but for the Dr’s to be able to give me this was a struggle. Access was a major issue. They just couldnt get any. They couldnt draw blood, the couldnt do an arterial blood gas and they couldnt get a venflon in. It was murder. I know I have pretty rubbish veins from all the previous admissions but they have normally got something into me to use short term. But not this time. I think we had 5 or 6 dr’s try and each one was more determined than the first. I felt like giving up it was hurting so much. Eventually we got a “pink ” venflon in one of the small veins on the under side of my wrist. It was agony as it was a very superficial vein and was so close to the surface. If you look closely you can see the vein bulging with the venflon. This luckily lasted for all my IV’s. I don’t know how but it did and I am thankful. The only thing now is that is has been removed it still feels like there is something in it as the vein i think it probably shot as it is really hard and lumpy now. You an see my nice red allergy band too. I don’t know how many attempts people had over the time I was in hospital at getting blood but it was just impossible. I feel battered and bruised. Dr’s I think have tried everywhere. I had numerous femoral stabs or which all were unsuccessful. My radial pulses are too difficult. For some reason the Dr’s hate doing brachial gases I think because they are more difficult and have a higher risk of complications afterwards. Even just getting a simple FBC blood test was difficult. My hands wouldn’t bleed. I was starting to think I had run out of blood. ~Despite the problems with access and bloods etc the admission was fairly uneventful. I was taken to my usual resp ward. I was given a side room which was nice. The ward I go to is a difficult asthma/ CF unit so they are set up for younger patients and have side rooms with tvs and dvd players and stereos etc in them which does make admissions easier when you are just lying in your bed!!! Mentally I feel very drained now that I am home. I was given a lot of information during this admission and also found a few things out which I really need to take stock of. Although I think I am very intune with how my body is I don’t think I am as much as I should be. I don’t think I seem to recognise when I am going downhill or if I do I try and block it out. I have been doing a lot more recently and this has had an effected on me but more of a gradual decline. I hadn’t noticed but I have lost a huge amount of weight even though I have increased my calorie intake. I am a bit worried about this as I dont know what to do to maintain my weight. My BMI is now 17.5 and given that I am 5ft10 and am fairly active and work long hours when on placement I cant really afford to lose weight as my energy levels will suffer etc. Although BMI is not an accurate way of measuring weight loss and body fat content it can be a rough guide and given that I have lost about a stone in just over a month I need to take note. I don’t want to become obsessive about weighing myself and calorie counting but I need to do something to make sure I take enough fo the right calories in and make sure I am maintaining my weight. I am going to see a dietician to try and maintain my weight and eat the right stuff. I feel mentally lethargic now and have been told to be off placement for another five days before returning. This has put a scupper to my summer holidays but it cant be helped. I need to do what is best for my chest and listen to my body. I am not going to put my degree in front of my health however much I want to. There is alot from the past admission I want to talk about and put down in a blog but I need to get my head round it all first and will post shorted blogs on how I feel about it all in time. I think this is kind of a long blog and a bit of a ramble. I may get a few dofferent drafts going and then post a whole load at once and see what happens. I am just finding this has taken it out of me a bit. If anyone has advise or words of wisdom I would love to hear them. I just don’t feel myself now and kind of lost in a topic I thought I understood a lot about. It sounds like you’ve got a lot to get your head around… please try to get lots of rest and then once you’re feeling better physically, it may be easier for you to build yourself back up mentally. Sorry to hear about your recent hospital stint :-(. I hope you make a quick recovery and the dietitian can help you out with the BMI.